What does “carbon ……” mean? Oops – we are going up again! How fast is the carbon clock ticking? Australia’s carbon pollution levels have increased for a third consecutive year. The Australian government has proposed no new credible policies to help cut Australia’s pollution levels. We are in the critical window of opportunity to act on climate change, yet the Federal Government’s climate policy is failing. Quarterly Update of Australia’s National Greenhouse Gas Inventory: June 2017 Incorporating NEM electricity emissions up to September 2017 provides estimates of Australia’s national inventory of greenhouse gas emissions up to the June quarter of 2017, and electricity emissions from the National Electricity Market (NEM) up to the September quarter 2017. Climate Censorship – why hide it?? AS THE GOVT WON’T TELL US….11 December 2017, The Guardian, Australia’s greenhouse gas emissions highest on record. Australia’s emissions over the past year were the highest on record, when relatively unreliable emissions from land use are excluded, according to estimates by the carbon consultancy NDEVR Environmental. Greenhouse gas emissions continued to rise in recent quarters, with the most recent the second highest for any quarter since 2011, despite electricity emissions being driven down by wind generation. The government’s official public release of data on emissions is now six months behind and NDEVR Environmental’s estimations attempt to mirror that methodology. 13 June 2017, The Conversation, There are those who say the climate has always changed, and that carbon dioxide levels have always fluctuated. That’s true. But it’s also true that since the industrial revolution, CO₂ levels in the atmosphere have climbed to levels that are unprecedented over hundreds of millennia. So here’s a short video we made, to put recent climate change and carbon dioxide emissions into the context of the past 800,000 years. Figures from the Global Carbon Budget 2017: This web page is only a repository for the figures presented in the Global Carbon Budget 2017. For details and explanations, please refer to the Global Carbon Project’s website. NASA, the US space agency, has released an “eye-popping” three-dimensional animation showing carbon dioxide emissions moving through the Earth’s atmosphere over the course of a year. It says the 3-D visualisation is “one of the most realistic views yet” of the “complex patterns in which carbon dioxide in the atmosphere increases, decreases and moves around the globe”. The data used to produce the visualisation was collected by NASA’s Orbiting Carbon Observatory-2 (OCO-2) satellite from September 2014 to September 2015. The data was then modelled and visualised by the Global Modeling and Assimilation Office at NASA’s Goddard Space Flight Center in Greenbelt, Maryland. Carbon flows between each reservoir in an exchange called the carbon cycle, which has slow and fast components. Any change in the cycle that shifts carbon out of one reservoir puts more carbon in the other reservoirs. Changes that put carbon gases into the atmosphere result in warmer temperatures on Earth. There are both slow and fast carbon cycles. Without human interference, the carbon in fossil fuels would leak slowly into the atmosphere through volcanic activity over millions of years in the slow carbon cycle. By burning coal, oil, and natural gas, we accelerate the process, releasing vast amounts of carbon (carbon that took millions of years to accumulate) into the atmosphere every year. By doing so, we move the carbon from the slow cycle to the fast cycle. In 2009, humans released about 8.4 billion tons of carbon into the atmosphere by burning fossil fuel. 16 December 2010, Yale Climate Connections: Understanding the carbon cycle is a key part of understanding the broader climate change issue. But a number of misconceptions floating around the blogosphere confuse basic concepts to argue that climate change is irrelevant because of the short residence time of carbon molecules in the atmosphere and the large overall carbon stock in the environment. It turns out that while much of the “pulse” of extra CO2 accumulating in the atmosphere would be absorbed over the next century if emissions miraculously were to end today, about 20 percent of that CO2 would remain for at least tens of thousands of years. The complex global carbon cycle process involves carbon absorption and release by the atmosphere, oceans, soils, and organic matter, and also emissions from anthropogenic fossil fuel combustion and land-use changes. The figure below shows the best estimate of annual carbon fluxes from main sources and sinks. (Figure is from Oak Ridge National Laboratories (Units in gigatons of carbon). At first glance, it may seem that the narrow black arrows representing anthropogenic sources are relatively insignificant, making up only a few percent of the total carbon released to the atmosphere in any given year. To understand why anthropogenic emissions are of concern, it is important to think of the carbon cycle as a balance of sorts; every year around 230 gigatons of carbon dioxide are released to the atmosphere, and around 230 gigatons of carbon dioxide are absorbed by the world’s oceans and biosphere. This balance forms an equilibrium of sorts, with the level of atmospheric carbon dioxide remaining largely unchanged over time. However, anthropogenic emissions throw this process out of kilter, adding a new source of emissions unmatched by additional sinks. At the 21st Conference of the Parties to the Climate Change Convention, in Paris in December 2015, the international community agreed to “pursue efforts” to limit temperature rise to no more than 1.50 C above the pre-industrial average, in order to prevent the dangerous effects of climate change.The challenge of this task is quite extraordinary. The IPCC has identified a range of ‘carbon budgets’ which define the maximum amount of carbon dioxide that can be emitted for any given likelihood of remaining below a given temperature rise. 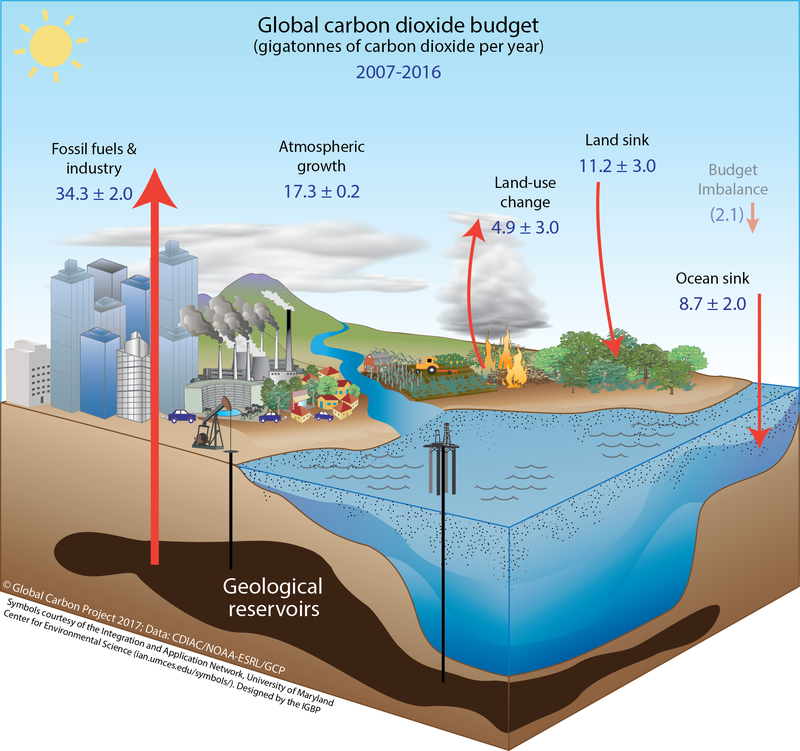 22 September 2014, Inside Climate News, Climate Primer: Explaining the Global Carbon Budget and Why It Matters: Once the amount of CO2 in the atmosphere tops 3.2 trillion metric tons, chances dim to avoid climate disaster, according to new calculations. For as long as scientists and policymakers have been grappling with climate change, they’ve been up against two critical questions: How much extra carbon has mankind sent into the atmosphere? And how much more can be added before global warming becomes disastrous? Climate researchers have spent decades tracking and quantifying the complex flows of carbon into and out of the atmosphere, but those questions couldn’t be answered convincingly until 2009. That’s when a group of European scientists published a groundbreaking and highly credible global carbon budget that filled the information void. Using a comprehensive climate model, the scientists determined the maximum amount of greenhouse gases mankind could send into the atmosphere without triggering catastrophe—and then found that more than a quarter of that budget had been spent by 2006. It’s an estimate of the maximum amount of greenhouse gases that can be released into the atmosphere over time and still keep warming limited to a specified level. In many cases, carbon budgets are pegged to holding the average global temperature increase below 2 degrees C compared with the beginning of the Industrial Age in the 18th Century. Accelerated burning of fossil fuels over the past 2½ centuries has poured billions of tons of carbon into the atmosphere, causing global surface air temperatures to warm already by an average of 0.8 degrees C. Scientists have estimated that 2-degree warming would trigger a host of more drastic changes in the climate, including effects that would be irreversible. Most carbon budgets focus solely on emissions of carbon dioxide, or CO2. That’s because it’s by far the largest contributor to global warming. Others, such as the carbon budget cited by the United Nations-led Intergovernmental Panel on Climate Change, include estimates for other greenhouse gases such as methane. For simplicity and consistency, this discussion refers only to carbon budgets that track CO2 emissions. In 1992, nations participating in climate treaty talks through the UN Framework Convention on Climate Change agreed to hold human-caused global warming below a level that would cause “dangerous” climate change. That led to the 2-degree benchmark and an agreement to consider lowering that goal to 1.5 degrees. Researchers from Germany, the U.K. and Switzerland, led by scientist Malte Meinshausen of the Potsdam Institute for Climate Impact Research, are widely credited with being the first—in 2009—to combine all of those elements into a rigorous, comprehensive scientific model to calculate a 2-degree carbon budget. Since then, carbon budgets have become a staple of climate change analysis. How big is the budget? The answer depends on several variables and it’s constantly being adjusted. The September 2014 carbon budget from the Global Carbon Project, a consortium of university and government scientists and researchers, put the latest 2-degree limit at 3.2 trillion metric tons of CO2. According to the budget, if emissions stay below that mark, there is roughly a 66 percent chance that the world would not trigger the most destructive forces of climate change. There are many in the scientific circles of climate change that are expressing the concern that there is NO carbon budget left. For the latest report concerning this access “Recount do the math again” by David Spratt, from Break Through site. Also access Two degree “safe limit” on The Science page of this site. NOAA: Earth System Research Laboratory – History of atmospheric carbon dioxide from 800,000 years ago until January, 2014. 25 February 2016, Climate News Network, Fossil fuel use will have to fall twice as fast as predicted if global warming is to be kept within the 2°C limit agreed internationally as being the point of no return, researchers say. Avoiding catastrophic warming requires stabilizing CO2 concentrations (or levels) in the atmosphere, not annual emissions. Studies find that many, if not most, people are confused about this, including highly informed people, mistakenly believing that if we stop increasing emissions, then global warming will stop. In fact, very deep reductions in greenhouse gas emissions are needed to stop global warming. While atmospheric concentrations (the total stock of CO2 already in the air) might be thought of as the water level in the bathtub, emissions (the yearly new flow into the air) are the rate of water flowing into a bathtub from the faucet. There is also a bathtub drain, which is analogous to the so-called carbon “sinks” such as the oceans and the soils. The water level won’t drop until the flow through the faucet is less than the flow through the drain. Similarly, carbon dioxide levels won’t stabilize until human-caused emissions are so low that the carbon sinks can essentially absorb them all. Under many scenarios, that requires more than an 80 percent drop in CO2 emissions. And if the goal is stabilization of temperature near or below the 2°C (3.6 °F) threshold for dangerous climate change that scientists and governments have identified, then CO2 emissions need to approach zero by 2100. So the first key point is that CO2 levels will continue rising if we merely keep annual CO2 emissions flat. In fact, they will keep rising at a faster and faster rate because the land and ocean carbon sinks are weakening (see below). 20 May 2016, Renew Economy, Just three years ago this month, the carbon dioxide monitoring station atop Hawaii’s Mauna Loa reached a significant milestone: the first measurement of CO2 concentrations that exceeded the benchmark of 400 parts per million (ppm). Now, they may never again dip below it. As CO2 levels once again approach their annual apex, they have reached astonishing heights. 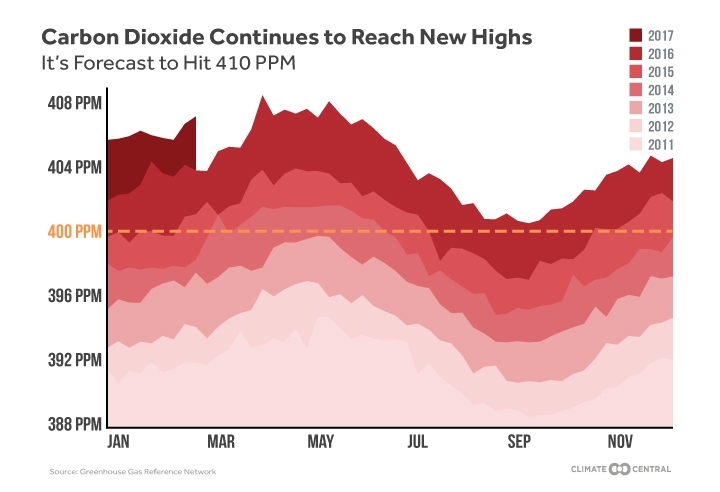 Concentrations in recent weeks have edged close to 410 ppm, thanks in part to a push from an exceptionally strong El Niño. What does CO2 equivalents (CO2-e) mean? There are other greenhouse gases which have far greater global warming potential (GWP)but are much less prevalent. These are sulphur hexafluoride (SF6), hydrofluorocarbons (HFCs), and perfluorocarbons (PFCs). There are a wide variety of uses for SF6, HFCs, and PFCs but they have been most commonly used as refrigerants and for fire suppression. Many of these compounds also have a depleting effect on ozone in the upper atmosphere. 4 August 2015, The Conversation, Reducing emissions alone won’t stop climate change: new research. Based on current greenhouse gas emissions, the world is on track for 4C warming by 2100 – well beyond the internationally agreed guardrail of 2C. To keep warming below 2C, we need to either reduce our emissions, or take carbon dioxide out of the atmosphere. Two papers published today investigate our ability to limit global warming and reverse the impacts of climate change. The first, published in Nature Communications, shows that to limit warming below 2C we will have to remove some carbon from the atmosphere, no matter how strongly we reduce emissions. The second, in Nature Climate Change, shows that even if we can remove enough CO2 to keep warming below 2C, it would not restore the oceans to the state they were in before we began altering the atmosphere. 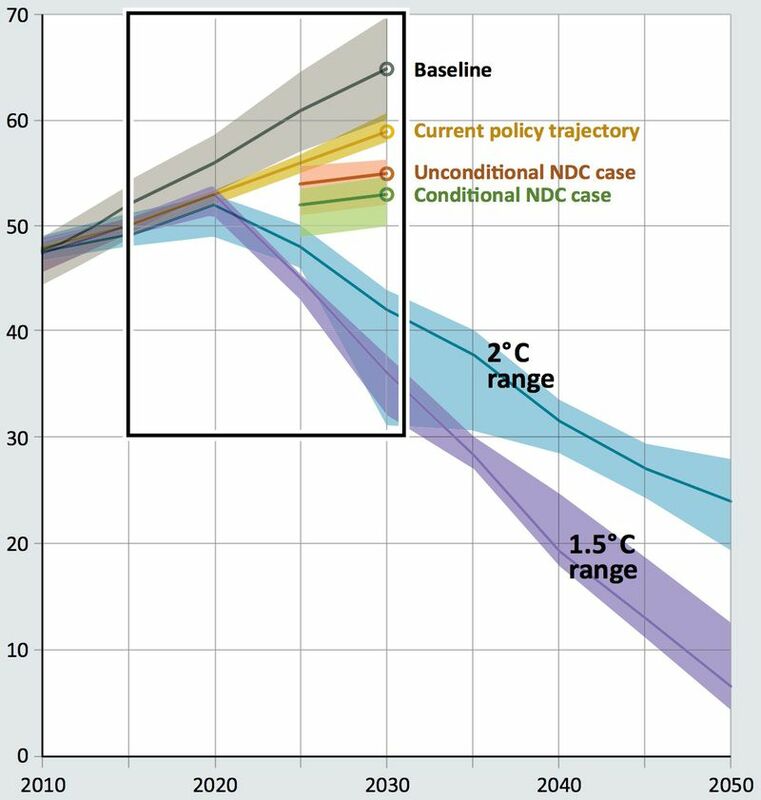 19 February 2015, European Environment Agency: Atmospheric greenhouse gas concentrations (CSI 013/CLIM 052) – Assessment: Key policy question: Will the atmospheric concentration of all greenhouse gases remain below 450 ppm CO2-equivalent, giving a 50% probability that the global temperature rise will not exceed 2 degrees Celsius above pre-industrial levels? The global average concentrations of various greenhouse gases (GHGs) in the atmosphere continue to increase. The combustion of fossil fuels from human activities and land-use changes are largely responsible for this increase. The concentration of all GHGs, including cooling aerosols that are relevant in the context of the 2oC temperature target, reached a value of 435 parts per million (ppm) CO2 equivalents in 2012, an increase of about 3 ppm compared to 2011. As such the concentration continued to close on the threshold of 450 ppm. In 2012, the concentration of the six GHGs included in the Kyoto Protocol had reached 449 ppm CO2 equivalent, an increase of 171 ppm (around +62%) compared to pre-industrial levels. The concentration of CO2, the most important GHG, reached a level of 393 ppm by 2012, and further increased to 396 ppm in 2013. This is an increase of approximately 118 ppm (around +42%) compared to pre-industrial levels. The various greenhouse gases each affect the climate system differently (see rationale). To evaluate the GHG concentration in the atmosphere in relation to temperature change, it is important to consider all greenhouse gases, i.e. the long-living GHGs under the Kyoto Protocol, those under the Montreal Protocol (direct and indirect), as well as ozone, water vapour and aerosols (IPCC, 2013). Considering these gases, the total CO2-equivalent concentration reached a level of 435 ppm CO2 equivalent. in 2012 ; an increase of 3.3 ppm compared to 2011. The increase is slightly higher than the average increase of the annual concentration over the past decade (i.e. is now 2.9 eq.yr-1). Overall, assuming a concentration threshold of 450 ppm CO2 equivalent could result in a 2oC temperature change (see rationale), this means concentrations can only increase by about a further 15 ppm before this threshold value is exceeded. Assuming the 2000-2012 trend of annual increase of total GHG concentrations will also continue in the coming years, the threshold value may be exceeded in about 5-10 years. The lower band of the uncertainty range has been exceeded already around the millennium change, whereas it may take 20-25 years before the upper uncertainty band is exceeded. 1 June 2015, The Conversation, Climate targets are letting ‘outsourced emissions’ slip through the cracks: Just because a country meets its emissions-reduction targets doesn’t mean it isn’t responsible for increased emissions elsewhere. This isn’t as weird as it sounds. The way national targets are calculated means some countries effectively “outsource” their emissions to other regions. If countries such as the UK don’t include the global emissions impact of their economy they run the risk of believing they are staving off climate change when they are not….Greenhouse gas emissions are usually considered in terms of those emitted within national boundaries; for example by cars and industries. These “territorial emissions” are the basis of national commitments and governments can influence them through taxes or regulations on emissions. In the UK, the general trend is towards a reduction in these territorial emissions, though it’s tough to say exactly what has happened over the past three years as there is a bit of a lag before annual statistics can be reported. However, it is instructive to take a wider perspective. Rather than considering the emissions that occur within the UK’s borders, we could think in terms of the emissions that are given off in the process of providing the goods and services enjoyed by its citizens. 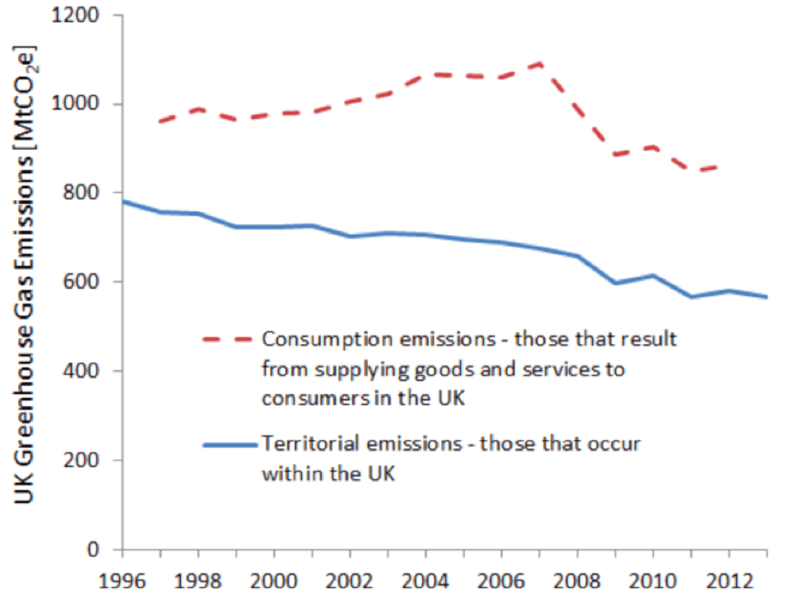 This “consumption-based” perspective looks at the whole life cycle of products consumed in a nation and reveals that supporting British lifestyles actually causes the emission of far more greenhouse gases than those emitted in the UK alone. This is because the UK’s imported goods require, on average, more greenhouse gases to be emitted during their production than the goods it exports. 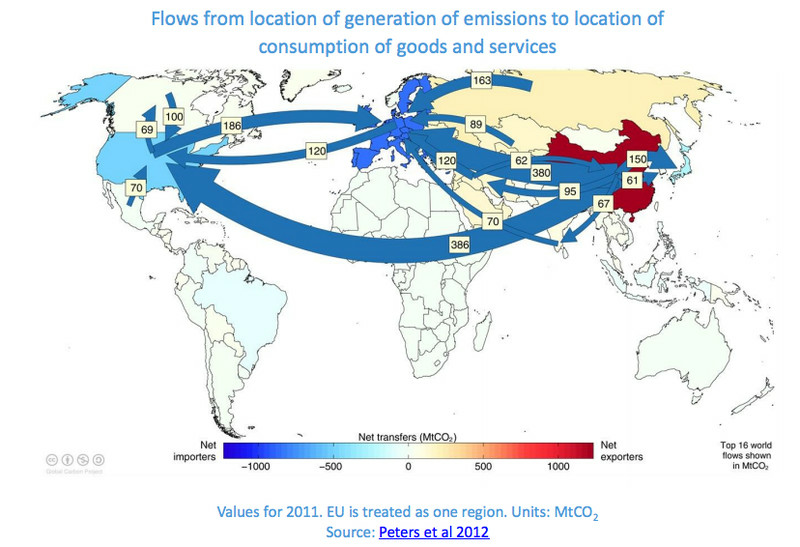 While goods and services are imported, emissions are effectively “outsourced” to other nations. This matters because greenhouse gas emissions have a global impact – the UK will be affected just as much by one tonne of carbon emitted in Shanghai as Sheffield. The UK has developed and signed up to a number of strategies and targets to reduce emissions, most notably the Climate Change Act which legally obliges an 80% reduction in greenhouse gas emissions by 2050. However unless emissions are addressed on a global scale, we run the risk of frustrating the purpose of these strategies by shifting the burden from our shores to others. 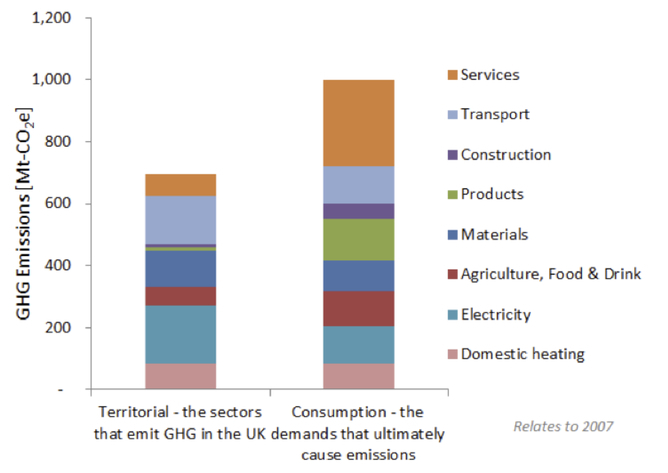 Looking at emissions based on consumption also gives us a clearer picture of which goods and services actually “drive” greenhouse gas pollution. It’s often not the processes directly responsible for the emissions…. Figure 2.6 shows estimates of the time it takes for different parts of the climate system to respond to a situation where emissions are reduced to equal the rate of natural removal. While greenhouse gas concentrations stabilise in around a hundred years, the temperature and sea-level rise due to thermal expansion of the oceans takes much longer to stabilise. The melting of ice sheets is still increasing the sea level even after a thousand years. The Global Carbon Project has published the report “Carbon Reductions and Offsets” with a number of recommendations for individuals and institutions who want to participate in this voluntary market. Source: Global Carbon Project (2008) Carbon reductions and offsets. Coulter L, Canadell J, Dhakal S. Global Carbon Project Report No. 6, ESSP Report No. 5, Canberra. December 2014, Carbon Trade Watch Report: A TREE FOR A FISH – The (il)logic behind selling biodiversity: Putting a price on ecological systems has been around for several decades, although it was especially heightened during the UN climate negotiations with the introduction of the carbon market, a system which places a monetary value on the carbon-cycle capacity of nature for trade in financial markets. The carbon market quickly became “the only game in town” that policy-makers and multilateral agencies would discuss and implement regarding climate change policy. Following this logic, the 2010 UN Convention on Biological Diversity (CBD) called for “innovative financial mechanisms’” to deal with biodiversity loss, making biodiversity offsets the standard buzzword within conservation debates. At the same time, people have been resisting projects that claim to compensate for biodiversity destruction and continue to demonstrate how this concept fails to address the drivers of environmental and social damage. Biodiversity offsets entail projects that cause destruction to biodiversity such as housing, highways or open-pit mines. These destructive projects are allowed to ‘compensate’ for any destruction of habitats or ecosystems, by implementing a project somewhere else which would theoretically protect or (re)create another habitat or ecosystem. To measure the economic ‘value’ of biodiversity, proponents affirm that accounting units are necessary, and hence, different biodiversity types, locations, times, and contexts are turned into apparent ‘equivalent’ numbers. The argument goes that the destruction in one place is ‘equivalent’ to the supposed protection, or re-creation, of another place. How are offset developers planning to inform the birds of their ‘new home’? The idea of ‘(re)creating’ a ‘new habitat’ elsewhere will almost certainly not be able to compensate for the loss of their ancient habitat. Ecological systems are linked with each other. One cannot ‘preserve nature’ on one part of a country while destroying another part, and claim that this is ‘balancing’ the loss. Whole ecosystems, animals’ behaviours like hunting and migration, plants, waterways, wind cycles, biodiversity, among many other ‘capacities’ of the ‘natural world’ are carefully and harmoniously linked. Offsets enable the colonization – and thus destruction – of the ‘natural world’ in search of economic gains. …….Reports concluding remarks: Reducing complex and interconnected ecosystems to a single monetary value reduces the ‘natural world’ into tradeable ‘units’ largely for corporate interests. Proponents claim that biodiversity offsetting is “the only option” to get business on board. But we have heard that argument before with the adoption of the carbon market. After over ten years, we can conclude that framing the market and the financialisation of nature as the “only possible option” is a lucrative method for destructive industries and practices to continue expanding their businesses. The idea that “price will solve biodiversity loss or pollution” has colonised peoples’ imaginations and forcibly ignored the many other positions and knowledges. Offsets impose a hegemonic view on how to perceive the world. A world where nature, biodiversity, forests, and rivers, can be separated, and quantified into homogenous units that can be ‘re-created’, ‘replaced’, ‘moved’ or ‘restored’ according to economic and costrelated ‘values’. 17 June 2015, CDP, Carbon price ask transcends corporate politics: The United Nations announced last week during the Bonn climate negotiations that it would take six European oil and gas companies up on their offer of support to establish a global carbon-pricing system. The proposal, which came from firms including Royal Dutch Shell and Total SA, was both unexpected and encouraging. But its significance transcends corporate policies. 27 May 2015, Carbon Brief, Carbon pricing schemes climb to $50bn, despite Australian backtracking: The value of carbon pricing schemes rose to $50 billion in 2015, according to a new assessment by the World Bank. It outlines its findings in the latest edition ofCarbon Pricing Watch, which examines the state of the world’s carbon markets in advance of its more detailed report due later this year. As of 1 April 2015, emissions trading schemes were valued at $34 billion, up from $32 billion the previous year. This was despite the repeal of Australia’s carbon pricing mechanism in July 2014 at the hands of prime minister Tony Abbott. Emissions trading schemes are not the only way to put a price on carbon. For the first time, the World Bank has also valued carbon taxes across the world, which it finds amount to $14 billion. The World Bank calculated the value of emissions trading schemes by multiplying the allowances issued for each scheme, multiplied by the price. Estimates of the price of carbon taxes were based on government budgets for 2015, or by the greenhouse gas emissions covered by the carbon price on 1 April 2015. All in all, emissions are currently being priced in 39 nations and 23 subnational jurisdictions, as the World Bank map shows below. Want to understand how carbon credits work in the “real” world? 13 May 2015, An innovative game to explore the range of futures open to the pastoral industry within a carbon economy has been launched by Federation University Australia. The game, Narmboolville, is based on the Sovereign Hill property Narmbool, 15 km south east of Ballarat. It brings together environmental science, accounting and information technology and is the culmination of a two-year research project supported by the Williamson H.D. Trust and Sovereign Hill Museums Association. The objective of this project is to bring together the principles of carbon sequestration and livestock management to encourage sustainable farm management practices under a range of future climate scenarios. The game, developed under the guidance of project co-coordinator Dr Charlynn Miller from FedUni, requires the user to secure an income from carbon but also seek to maintain an economically viable farm business. In essence the user becomes the farm manager, making decisions about the trade-off between managing for trees and agricultural production. The game is freely accessible via the University’s Narmbool game website. When starting the game, you can choose how much carbon you would like to sell as Australian Carbon Credit Units (ACCUs). ACCUs are regulated carbon credits issued by the Clean Energy Regulator for Australian sequestration or emission reduction projects. When you choose the amount of stored carbon to sell as ACCUs, keep in mind that a risk of reversal buffer will be deducted from your ACCUs. The larger the buffer size, the less ACCUs you will be issued upfront but the greater chance you will be able to maintain the carbon storage for 100 years. Basically, you promise to store carbon in the land and trees of Narmbool for 100 years and get paid to do it! Just make sure you manage the property well so that you don’t go broke in the meantime!